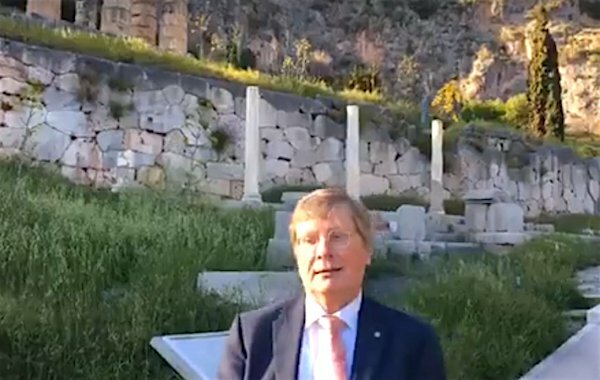 Philhellene Christian Kirsch is the founder of the International Delphic Council, an organization that revives the Pythian Games of Delphi — or Delphic Games — since 1997. Kirsch says that in Ancient Greece the Delphic Games were as important as the Olympic Games. Or rather the Delphic Games were for music and poetry what the Olympics were for sports. In some way, the two were completing each other as Ancient Greeks believed that a healthy mind is as important as a healthy body. The “modern day Lord Byron” — as Kirsch has been called — founded the International Delphi Council in Berlin in 1994, in order to revive the Delphic games in the modern era. After three years, Kirsch managed to organize the first Junior Delphic Games in Tbilisi, Georgia, to be followed in 2000 by the first Delphic Games in Moscow, Russia. Delphic Games have also been held in Kuching, Malaysia and Jeju-si, South Corea. Junior Delphic Games have been held in Dusseldorf, Germany; Baguio City, Philippines; Johannesburg, South Africa and Syracuse, New York, U.S.A. They are held under the auspices of UNESCO, the European Council and ASEAN nations. The Delphic Games of the modern era are inspired by the ancient Pythian Games of Delphi as a symbol for peace. The original Games were between artists and ethnic cultural groups. They took place each year preceding to the Olympic Games. They can be traced as far back as 2,600 years ago. Spiritual leaders of the past formed the Pan-Hellenic to perform wonders, theater, music, and poetry to praise the god Apollo, the symbol of the Oracle of Delphi. The Pythian Games were one of the four Panhellenic Games, a forerunner of the modern Olympic Games, held every four years at the sanctuary of Apollo at Delphi. According to Kirsch, the Pythian Games were the most significant peace initiative in ancient Greece. The 12 Greek tribes united after three wars and formed the Amphictyony, as a protector of the Delphi sanctuary and the Delphic (Pythian) Games. For him, the Delphic Games and the Amphictyony are the forerunner of United Nations. Furthermore, they should continue today as an artistic expression of peace and understanding between nations and people. After the revival of the Olympic Games, art competitions were held from 1912 to 1948 at the initiative of Pierre de Coubertin, the man who revived the modern day Olympics. Competitions in various forms of art were thematically related exclusively to the sport. Greek poet Angelos Sikelianos tried to revive the Delphic Games. In 1927, the Delphic Festival was held for the first time, but it was abandoned immediately after due to prohibitive operating costs. Delphic Festivals are held in the summer in Delphi, focused largely on tourists.